Korn have cemented their place in history, after being inducted on the RockWalk in Hollywood. 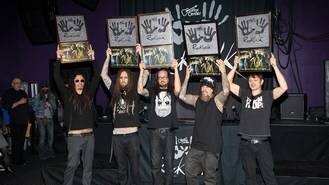 All five members of the Californian nu metal band - Jonathan Davis, James 'Munky' Shaffer, Brian 'Head' Welch, Reginald 'Fieldy' Arvizu and Ray Luzier - were on hand to be leave their handprints and signatures at the Guitar Centre, on Sunset Boulevard, to celebrate their 20th anniversary in the music business. Brian joked that the group aren't in the best shape, saying: "We're all pretty beat up. We've been on the road. Munky's thrown his back out, I got Fieldy and Jon sick, and Ray has smashed his hands so we're a broken heavy metal band right now. But we're here and this is just surreal." He added: "I grew up with these guys, so to be able to do this with them and be here is more than a dream come true. I'm so thankful." Musician and director Rob Zombie presented the group with their honours. "Immediately I could tell these guys are the real deal, they have something unique going on. Everything about it, from the double attack of the guitars, the bizarre bass-tone and the drums, was just so unique and so interesting," he said. Korn, who have won two Grammy awards and had hits with Freak On A Leash, Here To Stay and Let The Guilt Go, have recently released their 11th album, The Paradigm Shift. Sting has said some of the songs on his latest album, The Last Ship, reflect his own experiences of growing up in the North East. Robin Thicke, Drake, Keith Urban and Macklemore And Ryan Lewis are to perform at the Grammy Awards nominations special. Madonna is among the nominees for the 2014 Songwriters Hall of Fame. Una Healy has rubbished reports that The Saturdays are planning to split. Bruno Mars had a birthday to remember - when his fans sang to him at his latest show. Paris Hilton has promised her new album will be full of "bouncy club bangers" and will be a departure from her pop offerings of the past. Musician Phil Chevron, l ong-time guitarist with Irish folk-punk act The Pogues, has died after a battle with cancer. Gary Barlow has revealed his new single Let Me Go was inspired by Johnny Cash. Lady Gaga has unveiled the artwork for her new album Artpop.